This has been an interesting week to say the least. I'm so grateful that Mother's Day Out starts again next week, because this Momma needs a few hours to rest and relax during the week. The week after that we start our new MOPS group as well, praise the Lord! Between those and the small group we started attending at church last week - I'm starting to feel like we might settle in here a little more. The hardest thing for me has been having nothing to look forward to - and it being too hard to get out in the heat with two babies. There just isn't much you can do in the summer to get out of the house that doesn't involve spending money... we go to places like Target where they can ride in the cart, look around, and have a change of scenery - but if ya'll are anything like me... Target has a cover charge! Which for a family with 1 income and 2 houses - just doesn't really work out too well. 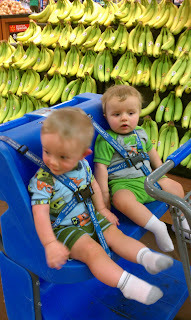 I'm trying to figure out ways to be more frugal, and I'm thinking of taking back over the household budget so that John isn't burdened with it... but also so that I can keep good tabs on the grocery budget and things like that to know what we can afford to do and what we can't. I hope that as things begin to cool down in the next month or two - going to the zoo will be a pleasant walk for us... and we can find some other places to go outside and stroll around. 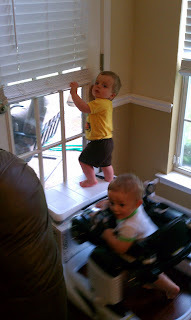 I titled this post the way I did - with Hooligans - because of the antics of my crazy men. Last Friday evening, James decided it was time to start walking... and he hasn't looked back. Each day he gets a little better, and a little more brave. On the heels of that - Tyler immediately began pulling up on things - as if he was telling James that he wouldn't be left behind, and that he needs to watch out because Ty is catching up! By Wednesday, Tyler took a spill though on his pulling up. 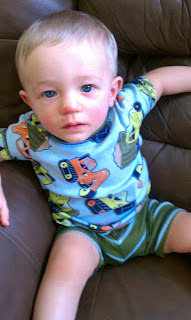 Our fireplace has a big brick hearth and the boys like using it as a pull up station or whatever else they can get away with... so Tyler tried to pull up on it, but before I could get to him to move him to a more stable location (or safe location) he slipped on a toy and scraped his nose and lip up pretty badly. It's still a big scabby mess - and it's so sad to look at. He was fine within a few minutes, but I was a weepy mess for several hours feeling guilt and sadness over my precious little man's face. Here we are a little later on Wednesday - we needed to get out of the house for a few minutes because we were all going crazy. I remembered we had run out of cream cheese for Daddy's morning bagel - and we then had a mission. The closest store to our house is not one I frequent, but it was a good option for this trip. I pulled up next to the cart return and saw this jewel... so I popped my boys in and off we went. Can I just say that the most annoying thing that anyone with twins or kids SUPER close in age hears on a daily basis is "you have your hands full." Really?! You don't think I know that it's tough, exhausting, and rewarding all at the same time? You don't think that I already know that they will push me to the edge of reason on a daily basis? I mean why don't you just say "better you than me!" What do you want to know about this crazy life I lead? I'm starting to answer "double trouble" comments with "double blessings" and the hands full comment with "Yes, full of good things!" I can't take credit for it - I read it on another blog. :) I'm getting more sensitive to what the kids will overhear and trying to make sure they don't get the idea that they cause trouble for me. Love the picture of them in the cart! Looks like it was a fun mission. Hope Daddy enjoyed his cream cheese as much as the boys enjoyed getting it for him!